This is #19 in a series of blog posts about recovering from the Gulf oil spill and from oil dependency overall. The first introduces the series. Today I applied to join Zipcar. I've wanted to join a carsharing service for some time, but one thing has held me up: carsharing has not yet expanded into my area. However, Zipcar – currently the largest carsharing service in the world, and in the U.S. – has now grown enough that it's worthwhile for me to join and use when I travel. This morning I signed up for their "Occasional" plan. Why do this? I travel car-free as much as I can, but for some trips, driving is the most practical option. In those cases I choose to rent cars, and try to get hybrids when I can. Sometimes, though, I only want a car for less than the full day most rental companies use as a minimum. 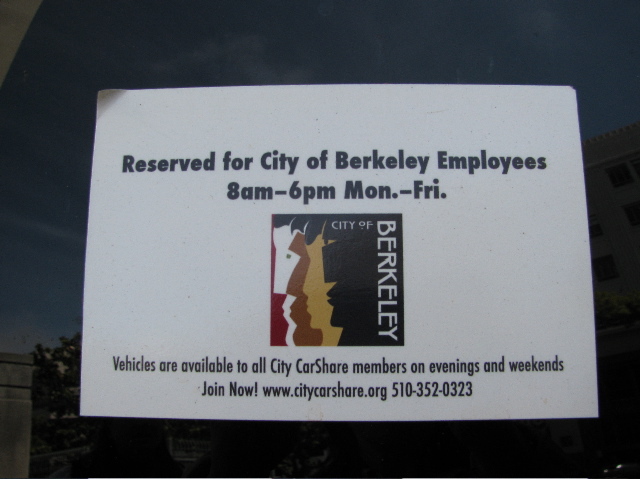 That's when carsharing, which allows members to reserve cars by the hour, becomes a very useful option. I'm also joining because I'd like to see the practice of carsharing grow. Studies show that more carsharing means fewer cars; the Zipcar website estimates that every carshare vehicle takes 15 to 20 personally-owned vehicles off the road. Not only does carsharing cut the number of vehicles, it also reduces miles of driving. Because carsharing is priced differently than car ownership, with members paying for their actual use of a vehicle and not for all the costs associated with having one sit in the garage, carsharing users drive more judiciously than car owners. In a retrospective study, Susan Shaheen and co-authors from University of California, Berkeley's Transportation Sustainability Research Center report that carsharing cuts vehicle miles traveled by about 44% on average. It also leads to greater use of transit, cycling and walking as well as reduced parking demand. That all adds up to significant reductions in oil and gas consumption. 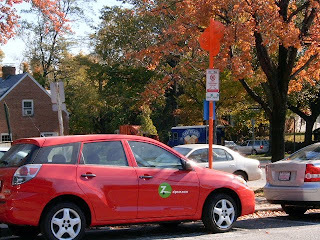 A Zipcar sits waiting for use in its reserved parking space. Most carsharing services offer a variety of vehicle types for use by members. Another big reason carsharing now enjoys sizable growth, and maybe the biggest: it saves people money. 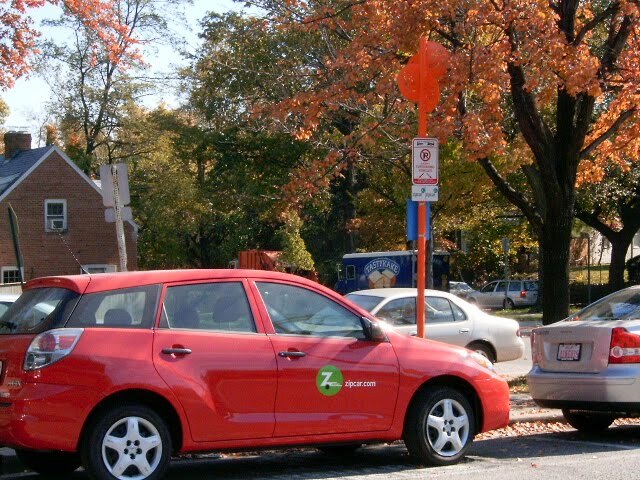 Zipcar estimates its members can save around $500 per month if they use carsharing instead of owning a car. Susan Shaheen et al found that carsharing members save $154 to $435 per month, a more conservative range but still substantial. I like the way carsharing works. With Zipcar, once you join, you can reserve a car by the hour or by the day anywhere in the system. Reservations can be made by phone or online. A smartcard gives you access to the nearest car, parked in some central location in the area served. The company pays for the gas: your rates cover fuel costs, insurance, roadside assistance, and mileage. A Zipcar member accesses a reserved car by waving a smartcard over a card reader inside the car's windshield. Many members use carsharing in place of a second car, and some use it in place of owning any car at all. This second option works well for those who live in urban areas served by good transit, where car ownership is often a costly hassle. When Divorce Your Car! came out ten years ago, carsharing had reached a healthy adolescence in Europe and the pre-teen stage in Canada, but was in early infancy in the United States. Today, the field is maturing, with 27 different carsharing programs in about 50 U.S. cities, nearly 7,600 vehicles and approaching half a million members. Besides Zipcar, a number of smaller carsharing services exist in the U.S., some for profit, some non-profit. You can check the CarSharing.Net website for a list of services and locations, with links. I see carsharing as part of a new approach that can help us recover from oil dependence. Carsharing services tend to share that goal, thus using a high percentage of fuel-efficient or hybrid vehicles in their fleets. The Zipcar website lists a plug-in hybrid getting over 100 mpg as one of its San Francisco cars. A short distance to the north, in Sebastopol, California, SolarCarShare – a project of the Post-Carbon Institute – is about to launch with a small fleet consisting entirely of electric vehicles and hybrids. The service has installed electric charging stations around town with the intention of using renewables – solar and wind – to power them. 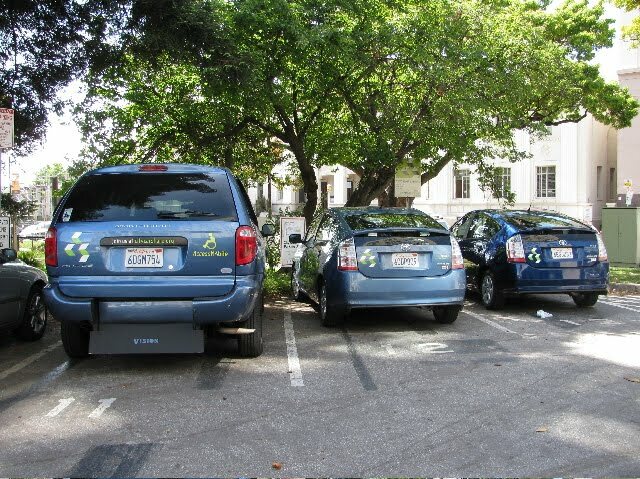 CityCarShare vehicles - a disabled-accessible van and two hybrids -- sit waiting for users in Berkeley, California, where the carsharing service shares vehicles with the city government -- see below. I'm hoping it's only a matter of time before carsharing opens near me. Right now, the biggest growth market for carsharing is on college campuses, and I live not far from two universities. 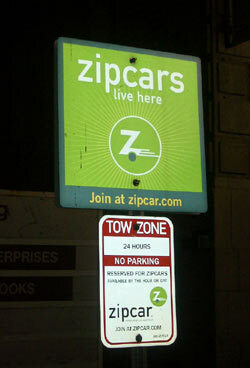 Zipcar currently has plans to expand, and as they do, I hope they'll look this way. By the way, to sign up for Zipcar, cover the $25 application fee and pay $50 for a year's membership, I used my Amtrak Guest Rewards credit card, which sends Amtrak a cut of my purchases and nets me points to redeem for train travel in exchange. Instead of swiping my credit card at a gas pump, it feels good to have voted with my dollars for a different kind of transportation. It's one that gives me travel options without requiring car ownership; it has the potential to save me money; and -- hardly least on the list -- it uses a lot less oil. Thanks to the Zipcar managers from Portland, Oregon, who originally supplied me with the top three images above for a presentation about reducing dependence on automobiles. Wish this had been an option when we lived in NYC. It's really a brilliant idea. Laura, you've lived in some carsharing hot spots -- but have moved away too soon! The first carsharing biz in the U.S. started up in Portland, Oregon, in the late 1990s -- it has since been absorbed into Zipcar, I think. Maybe we can get Zipcar to come to the U.P., since their expansion lately has mostly been on college campuses. Don't move away yet!